A new music event is offering free entry to the “heroic” rescuers who sprang into action after bad weather hit Festival No 6, plus half-price tickets to the audience who got caught up in a sea of mud. Local farmers used tractors and 4x4s to help drag out thousands of cars stranded in a sea of mud, while first aiders tended to music fans forced to spend the night in a local leisure centre, after the Portmeirion event was hit torrential rain and high winds. 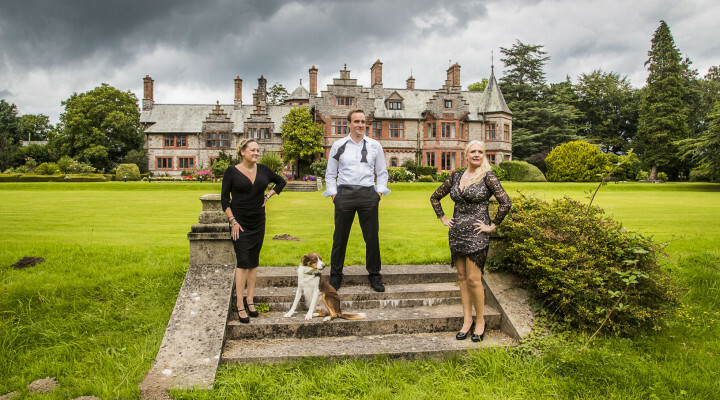 Now those who helped out are being invited to join the audience for free at Gorjys Secrets, the first singer-songwriter festival in the UK, which is being held in the idyllic setting of Caer Rhun Hall in the Conwy Valley on Saturday (September 17). The line-up includes a host of talent including Mercury Prize nominated Seth Lakeman, world beat-box champion Bellatrix, BBC Radio One DJ Dave Pearce and BAFTA-winning comedian Tudur Owen who was a smash hit at the Edinburgh Fringe Festival. Half-price tickets are also on offer to music fans caught in bad weather at Festival No 6, said Tansy Rogerson, one of the four organisers of Gorjys Secret Festival, whose vehicle was stuck in a flooded car park at Porthmadog for two days. She said: “Festival No. 6 is a great event, and I’m sure they are mortified by what happened and will put it right next year. “The front line staff looked after all the distressed people who had their car stuck, they were incredibly caring and did all they could to look after everyone. “I was amazed by the spirit of everybody who helped out and tried to rescue the vehicles from the car park, or lent a hand at the leisure centre. Although my car was stuck fast in the mud, I was fortunate and was able to get home thanks to a lift, but I really felt for those music fans caught up in the situation. “It would be amazing if the farmer and his girlfriend that rescued me got in touch, as I never got the chance to get their names, and say thank you again. At Gorjys Secret Festival, UK and world beatbox champion Bellatrix will be performing her unique mix of music, songs and double bass. She is promising to showcase new material in her gig and says she is inspired by the Snowdonia landscape, especially after performing at festival No 6. “I find the Welsh language mystical and rhythmic – everything about Celticness excites me, such as Welsh folklore and stories. Just seeing Welsh place names written down gives a sense of what they are describing and for me that’s inspiring. Bel, who grew up in the West Country, won her first world beatbox champion title in 2009, when she was just 17. She went on to gain the double crown of world and UK team champion in 2014 and 2015. Unlike most beatboxers, she has a degree in jazz double bass from the Guildhall School of Music & Drama, with her influences ranging from hip-hop to folk. She has performed at Glastonbury, the Royal Albert Hall and Womad World Music festival, and with legendary vocal group The Swingle Singers, Imogen Heap, Jarvis Cocker, DJ Yoda, Beardyman, Kate Tempest, Martina Topley-Bird, Tiny Tempah and supported Roots Manuva, Nick Mulvey, The Pharcyde, Dilated Peoples and Massive Attack. She writes her own material, and believes the rise in YouTube and other video streaming online is encouraging a new generation of singer-songwriters. “It means anybody can do it, and spreads the power out rather than leaving it in the hands of a select few” she added. Organised by a new events company set up by four partners who are hoping to boost the local economy, Gorjys Secret Festival is backed by Conwy County Borough Council, Go North Wales, Surf Snowdonia, Zip World, Supertemps, North Wales Honda, Arriva, Venue Cymru and Engedi Arts. The family-friendly event, which kicks off at 9am on Saturday September 17, offers a kids camp, basket weaving, face painting, donkey rides, giant bubble making, circus skills sessions, stone balancing workshops, and croquet. Adult activities include axe throwing, gourmet BBQ, artisan coffees, wine bars and craft beers, plus the chance to explore an ancient Roman fort and 14th century church. On stage will be award-winning blues guitarist Marcus Bonfanti, who has played with Robert Cray and Chuck Berry, former Squeeze and folk guitarist Nick Harper, blues vocalist Katey Brooks, South Wales four-piece Climbing Trees, Seattle-born ex-busker Tom Butler and Manchester-based duo We Were Strangers. Also performing will be Caernarfon singer-songwriter Sera, who will be launching her new album, which has already received rave reviews. The after-show party features Radio One DJ Dave Pearce, craft ales and a gin bar. Events company Gorjys was co-founded by Gavin Mart with Anna Openshaw, Tansy Rogerson and Jonathan Hughes. Gavin also created the 3RDSPACE bar and venue, a social enterprise based in the Great Orme Brewery in Builder Street, Llandudno. Gavin, who also performed at Festival No 6, said: “All four of us partners are very heavily involved and committed to making this festival truly special. “This is a real celebration of singer-songwriters, and that’s reflected in who is appearing. We wanted to showcase touring artistes, rather than the big arena bands. It means the artistes are from very diverse genres, so there really is something for everybody. “This is a festival for everyone, families, friends, suitable for all ages – we wanted to create something that would boost the economy of this area, and that’s exactly what we are doing.